What is Conditional Content used for? Who can use Conditional Content? How to use Conditional Content? Conditional Content is an intelligent set of rules and conditions using which you can hide or display specific content on your help site. 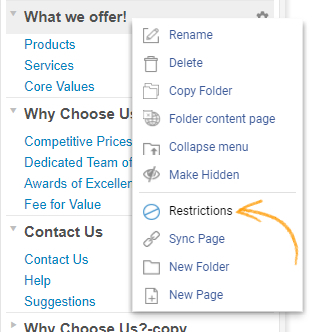 1: Open the contextual menu for the page and navigate to "Restrictions." 2: Set up the conditional logic, in this case, the viewing device. Save the changes. 3: Here's a preview of the site on a Mobile device: The page on which restrictions were set up is not visible in the menu. Administrator - The administrator can access all features and the Settings section of the application. 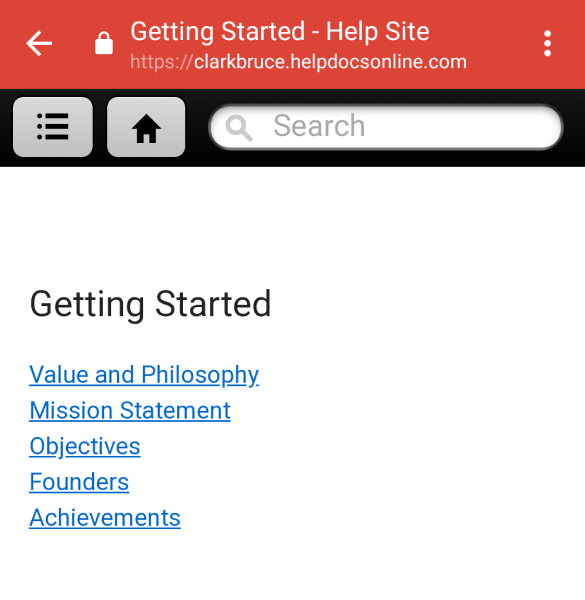 Editor -The administrator can add a user as an Editor for a help site. The Editor can create and publish content in your help site. The Editor can also set conditional logic of folders and pages in your help site but cannot access the Settings section of the application. Conditional content can be used to set up restrictions to folders, pages, and specific content on a page. 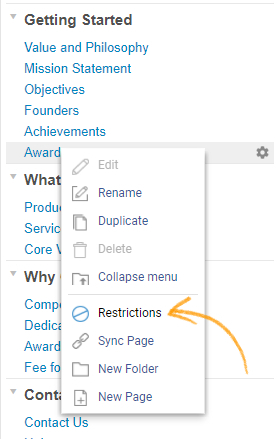 You can set up restrictions separately every time you need to restrict viewing based upon a condition, or you can set up Rule Sets and use them whenever you feel the need to restrict a folder, page, or specific content on a page. 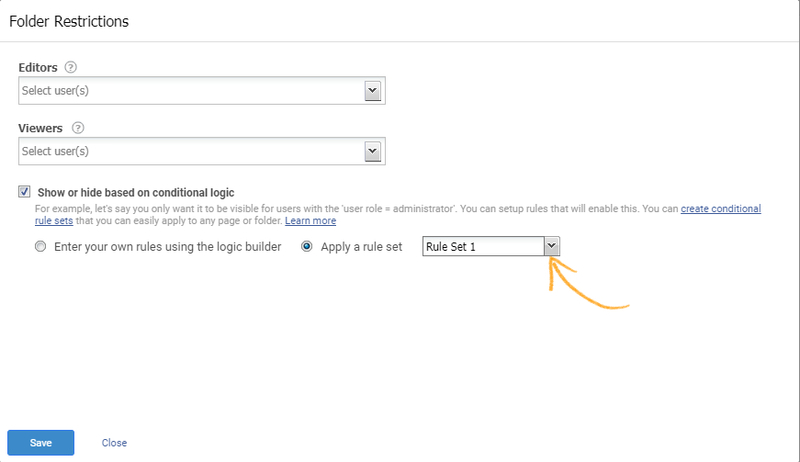 You can create rule sets, which can be instantly applied to one or many sites. For instance, you may want to restrict your customers from viewing certain folders, when they access your knowledge base from their mobiles. 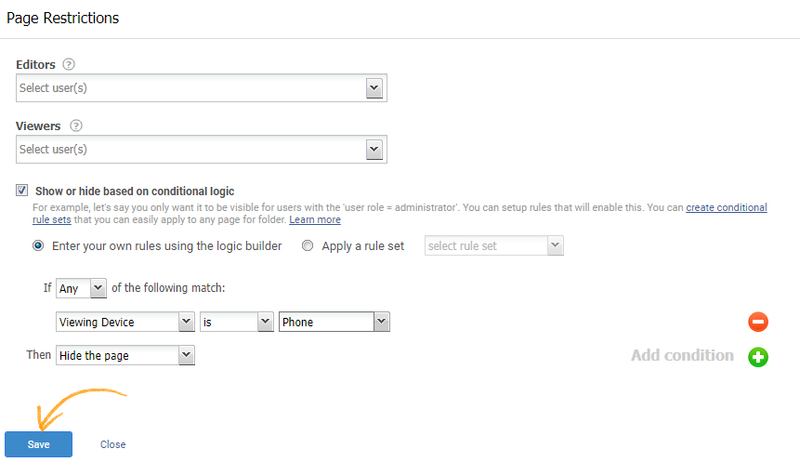 Similarly, you can also create rule sets for page and content level restrictions. Tip* You can also create conditions for each folder, page or content separately. By applying rule sets, you can save time and effort. 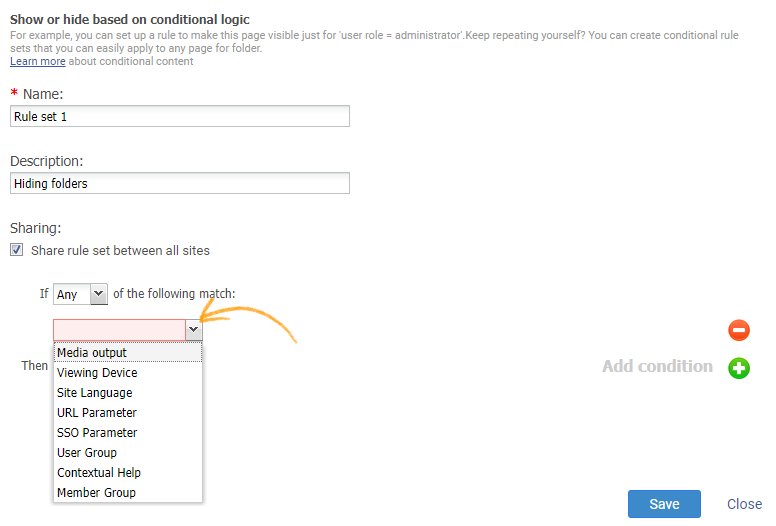 Step 1: Navigate to "Settings" -----> "Conditional Content"
Step 2: Click "New Rule Set." Step 3: Enter name, description, select the condition from the drop-down menu, select action- 'Hide the content' or 'Show the content.' Click "Save" to secure the rule set. Step 1: Open the contextual menu for the folder and click "Restrictions." Step 2: Choose "Show or hide based on conditional logic" and select "Apply a rule set," select the rule set from the drop-down menu and click "Save."